Removal of 4 Brigman Creek dams improves Johnson Creek water quality, habitat. 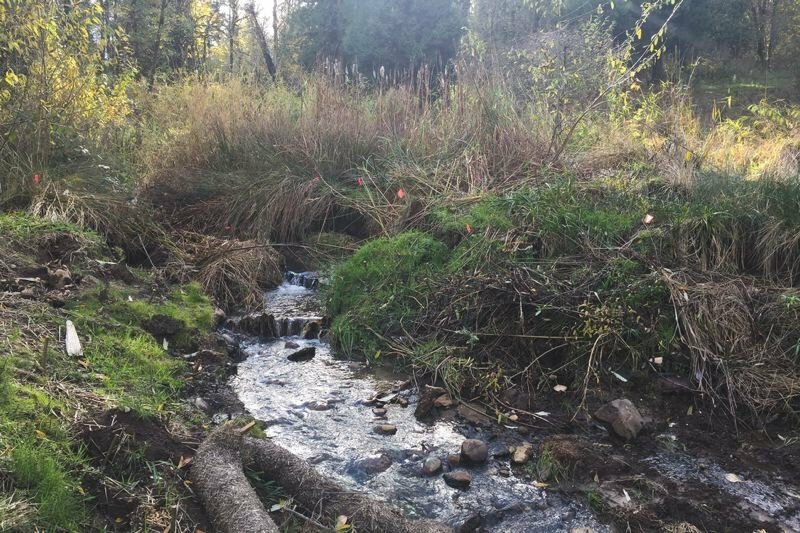 One day in 2014, Metro scientists visited a newly acquired 17-acre natural area in Gresham where Brigman Creek flows into Johnson Creek. As I walked along the edge of Brigman Creek, non-native bull frogs leapt into a muddy-bottomed pond rimmed with non-native plants. We were thinking about how to restore habitat for native plants and animals and improve water quality along Johnson and Brigman creeks. Decades ago, a former owner used chunks of concrete and asphalt, rocks, logs and plastic lining to construct four small dams along 300 feet of the creek. The dammed creek could not provide a refuge for salmon, and the stagnant waters behind the dams made poor habitat for native fish and macroinvertebrates. The fix for improving Brigman Creek was obvious: remove the dams, let the stream reclaim its path to Johnson Creek, and of course, plant native trees. A river is fed by a network of smaller streams. The majority of these streams, such as Brigman Creek, are so small that a person can easily step over the stream. Though they may appear inconsequential, in this case, small is very good. Native animals such as cutthroat trout, caddisflies and Pacific giant salamanders may spend all or part of their life cycle in or near small streams. Juvenile salmon move into them to find refuge from fast-moving waters. And natural pools in small creeks provide protection from the predators found in bigger streams. These step-over streams are excellent at slowing and storing organic matter, transforming large wood, dead leaves and dead animal bodies into bits of food. Birds and bats benefit from a rich mix of insects found in and above the plants next to the stream. Improving water quality and habitat along Johnson Creek means improving tributaries like Brigman Creek. We spent a year developing the Brigman Creek dam removal plan and securing the necessary permits, using money from the natural areas bond measure voters approved in 2006. Instream restoration work is usually scheduled for late summer during low water conditions to protect fish. This prep work and timing helps us minimize the short-term negative impacts that might happen when restoration work takes place in stream channels. Though it took a year of planning, removing four dams from Brigman Creek was less than a full day's work. By mid-August 2017, the materials and equipment needed for the project were on site and we could begin. Erosion control materials were in place. Wildlife within the work area, including cutthroat and sculpin, were collected and released into Johnson Creek. 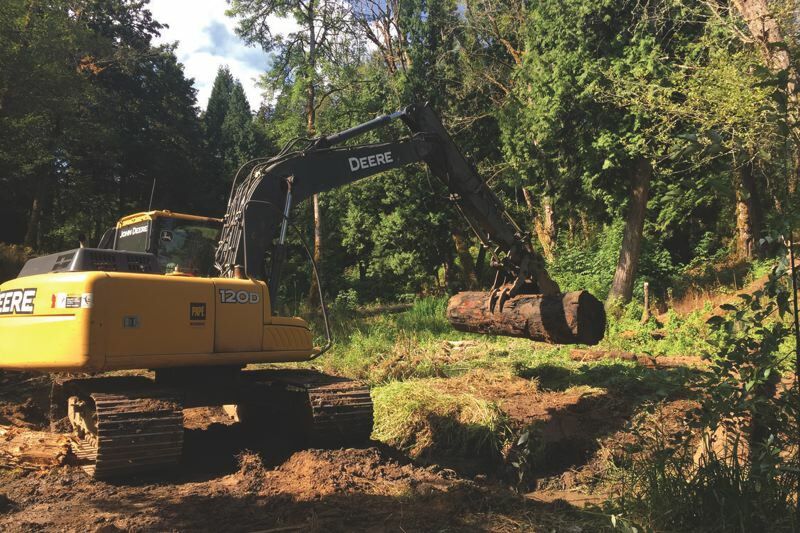 The excavator dug into the first dam, and the creek restoration began. Piles of manmade debris grew as the excavator scooped and pulled the dams from the stream. Immediately after the first dam was taken out, native signal crawfish began to move into the flowing water. As each dam was removed, the water continued cutting through the deposits of mud, rediscovering its natural channel. In a few more days the project wrapped up. Through this past fall and winter, I've been monitoring the changes in the stream as storms send pulses of higher water down Brigman Creek. It may take a few years for the stream to settle into the new channel. But after more than 40 years, this little stream is flowing free again – good news for wildlife and water quality. Kate Holleran is a senior natural resources scientist at Metro Parks and Nature.